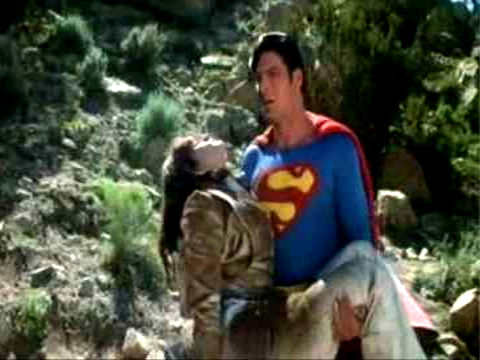 Superman knew he was too late well before he pulled the car from the crevasse. Lois was dead. He’d gone after the nuclear missile; he had to. One love, however great, isn’t worth millions of lives. He’d done the right thing, but even at super-speed you can’t be everywhere at once. The rightness of his choice was little consolation. As he looked down at her broken body, a brokenness he could barely conceive of, a great sorrow shook his body. She was the one, she was gone. He would always be alone. Sorrow turned to despair, and despair to howling rage. In fury he took to the sky. He accelerated past sound and light barriers, circling the Earth again and again. His revolutions magnetized the ions of space, pushing back on the earth’s spin. West to east he whipped around, and the Earth began to turn backwards. For the first time since the birth of the solar system, the sun set in the East, as the day reversed itself. Finally he broke his spin and let the Earth return to its usual course. He came down to where he’d left Lois before his flight. Of course, she was still dead, but at least everything else was as well. His gyration of the earth had set loose massive tidal waves, balkanized the Earth’s crust, and stripped the atmosphere off the planet. Now all was rapidly freezing lava. Superman sat down on the freezing rock that was his home, and began to mourn his lost love. 1) It holds Romney to his nomination-stage extremism and exposes his pandering shiftiness. 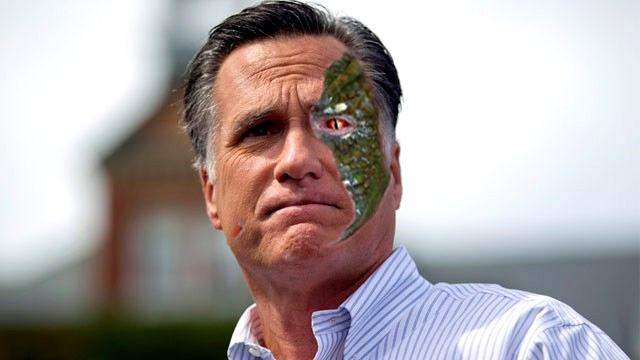 2) It points out how unlikable Romney is on a physical level. 3) It calls attention to the Reptoid agenda that is at the heart of the GOP platform. 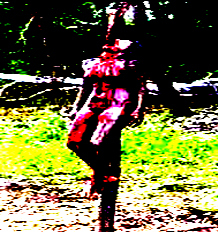 They could smell burning flesh as they approached the temple. The sweet smoke rose from a woman – perhaps one of the Order. She had been impaled on a roughly hewn wooden post sunk in the fountain of the entry courtyard. When last they had visited the place that fountain ran with clear water. Now the spring had been fouled; a thick, dark fluid ran clotted and scabbed over the rim of the fountain, puddling around the woman. She shuddered slightly as they approached, her frame settling lower on the post. The smoke came from a necklace she wore about her neck. Her skin cracked and sputtered around the cord and whatever amulet it held, scorched scar tissue trying to swallow the thing. She opened one bloodshot eye — the other was nothing more than a crusted mass of pus — and looked down at the men surrounding her. A croak that was almost a sigh leaked around the shaft of the post jutting from her mouth. As if this were a joke. “How can she still be alive?” asked one of his companions. He couldn’t focus on which one it had been, couldn’t see anything but the abomination in front of him, couldn’t breathe anything but the greasy cloud that threatened to choke the hope from his voice. As if in response, the woman’s exposed skin crackled with fresh vigor as the sun came from behind a cloud. Her body twitched and shivered, and her one eye bulged and finally popped in a gout of steaming gore that turned to smoke before hitting the ground. Still she whimpered. He unlimbered his pack and hefted his mace. The words of the ritual gathered in his mind, almost unbidden. “She’s not,” he said.